If you’ve spent any time hunting around the Pedal Finder site, you’ve discovered that not only can you find new-to-you pedals using one of the three search options available, but you can also submit information to the site that doesn’t already exist. This is because Pedal Finder is a collaboration of users. In fact, Pedal Finder relies on users to submit their knowledge and opinions in order to ensure that the database of pedals, musicians and reviews is as complete as possible. And, when you do submit information to the site, you will be rewarded with an entry into monthly drawings for a free effects pedal. Every time you enter key information and that information is posted to Pedal Finder, you receive one entry into a drawing for a free effects pedal. The best part about each of your entries is that they are permanent. Receive an entry into the giveaway this month and that entry will count for any future drawings we have. The more reviews and pedals you submit the more entries into the monthly drawings you will have. Pretty simple stuff. So what counts towards an entry? Perhaps the most useful content you can provide Pedal Finder is your opinion. We and everyone else want to hear your views on the pedals you’ve used and owned. But, don’t just tell us what you like and what you don’t like. Using the review tool let us know how you used the pedal and in what styles of music. Here’s a breakdown of what you can expect when leaving a review. First off, if you see a stripe of red at the top, then you need to log in. If you don’t have an account you can create one right here. If you are not logged in, then reviews you leave will not be counted as entries in the free pedal drawings. So make sure you are logged in if you want to enter the drawings. Instrument: This is easy, just let everyone know what instrument you play. Pickups: If you’re using a guitar or bass, let everyone know about your pickups. The type of pickup can effect how a pedal ultimately sounds. Amp: Solid State, Tube, Direct In, Mixer or other. Amps are important to the overall sound and different pedals push out different tones depending on what they run through. Genre: This is where you let everyone know what style of music you play. Feel free to pick more than one genre if you don’t like being pinned down and put in a box. Application: How do you use the pedal? Is it only on during your solos or constantly on regardless of what you’re doing. After you finish telling us all about yourself, scroll down and start telling us about the pedal. Using the bars provided, score the features, sound quality, build quality, value and overall rating of the pedal in question. Just so there isn’t any confusion, zero is bad – 5 is good. Reviewer Name: Your name goes here. Tell Us About The Pedal: Write a few paragraphs outlining your experience with the pedal and tell us whatever else comes to mind. This is the true heart of the review, so don’t be shy. The second most useful content you can provide Pedal Finder is information about Pedals that we don’t have in our Database. 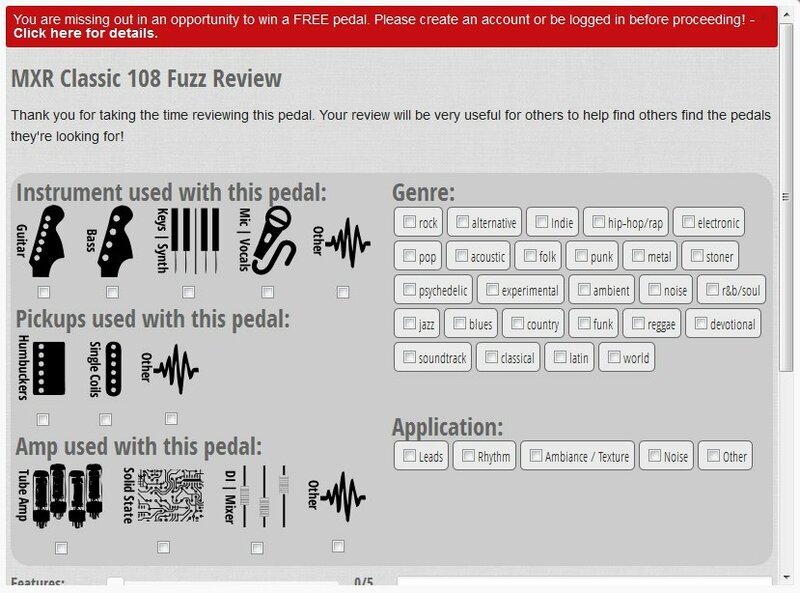 If you go to review a pedal that we don’t have in the database, then you can submit the pedal yourself and if it is approved, gain an entry in the drawings. Here is what the form looks like and how to fill it out. Pedal Name: Include the manufacturer name and then the pedal name. So, you might write, “JHS Pulp and Peel.” This is the format we use on the site. 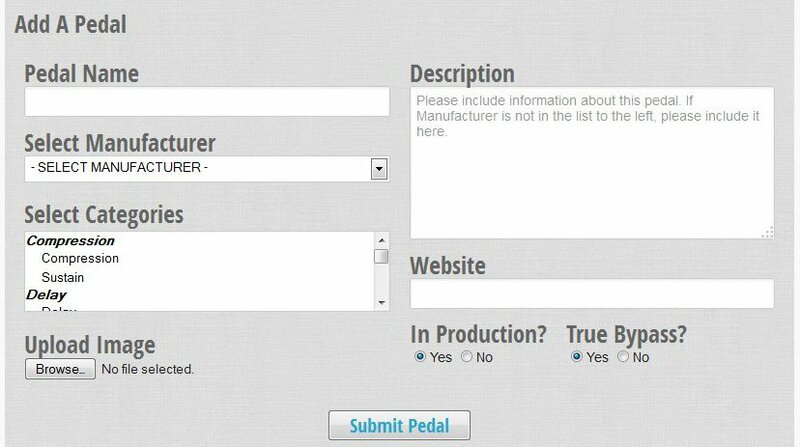 Manufacturer: Use the drop down list to find the manufacturer of the pedal. If you don’t find the manufacturer in the drop down list, that means we don’t have any of their pedals yet. Just leave this blank and mention the manufacturers name in the ‘description’ of the pedal with a note that the manufacturer needs to be added. Categories: We need to know if it’s a compression pedal or a distortion pedal. If you need to pick more than one category, you can click the first category and then hold down ‘ctrl’ while choosing the other categories. This should allow you to highlight all the ones that apply. Image: If you have a good image, go ahead and upload it. Description: This is where you describe the pedal factually. This isn’t really a place for reviews, it’s more about how big it is, how many switches or knobs it has and the effects it produces. Website: If you have one, leave a link to a website with information about the pedal to make it easier for us to verify the facts. In Production: Is the manufacturer still making the pedal? True Bypass: Does the pedal have True Bypass functionality? For any of the above questions, if you don’t know the answer, leave it blank and we’ll do our best to find and verify the information. However, the more information you give us, the easier it is to verify the content and the quicker you get your entry into future drawings. You can enter in as many artists/bands as you want, just make sure to separate each unique tag with a comma. Hit submit and we’ll review it. If it looks good then you’ll gain an entry into the drawings. Copy and paste the URL of the video into the empty field and hit submit. Please note that we are going to be very picky with the YouTube videos we approve. There are a lot of videos to choose from and we want to make sure we only link to the best. And that’s that. We covered a lot of information in this post, but none of it is too complicated. Regardless, if you have questions, feel free to contact us via email or leave a comment below and we’ll get back to you as soon as possible. Happy hunting and good luck!